Obesity puts you at a greater risk of a variety of diseases—including breast cancer. 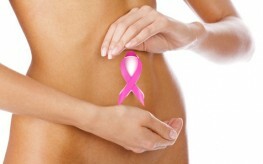 But a recent study says the link between your waistline and breast cancer doesn’t stop there. Researchers with the Tulane School of Medicine say that obesity is directly related to breast cancer cell growth and even tumor size. According to the study published in Breast Cancer Research, analysis of fat stem cell lines taken from women undergoing liposuction were injected into the mammary glands of mice where they accompanied breast cancer cells. The cells taken from obese women were associated with increased cancer cell numbers and tumor growth. Also significant, those cells taken from abdominal fat offered the most dramatic cellular changes. The scientists believe the results could be due to the fat cells exposure to estrogen, which increases the production of the hormone leptin. Leptin, in turn, increases the number of cancer cells and the growth of tumors. This isn’t the first study to link obesity and breast cancer risk – far from it. One published in JAMA over 7 years ago found 80,000 nurses who gained 55 pounds or more after the age of 18 had a 50% increased risk of breast cancer. We know a lot about the causes of breast cancer, or at least what increases breast cancer risk. Our first line of defense against the disease, therefore, should be in applying these studies to our everyday life. If obesity increases breast cancer risk as well as tumor size and growth, it would stand to reason that avoiding obesity or losing weight if one is already obese could lessen your risk.